Molecular testing is becoming an important part of the diagnosis of any patient with cancer. The challenge to laboratories is to meet this need, using reliable methods and processes to ensure that patients receive a timely and accurate report on which their treatment will be based. The aim of this paper is to provide minimum requirements for the management of molecular pathology laboratories. This general guidance should be augmented by the specific guidance available for different tumour types and tests. Preanalytical considerations are important, and careful consideration of the way in which specimens are obtained and reach the laboratory is necessary. Sample receipt and handling follow standard operating procedures, but some alterations may be necessary if molecular testing is to be performed, for instance to control tissue fixation. DNA and RNA extraction can be standardised and should be checked for quality and quantity of output on a regular basis. The choice of analytical method(s) depends on clinical requirements, desired turnaround time, and expertise available. Internal quality control, regular internal audit of the whole testing process, laboratory accreditation, and continual participation in external quality assessment schemes are prerequisites for delivery of a reliable service. A molecular pathology report should accurately convey the information the clinician needs to treat the patient with sufficient information to allow for correct interpretation of the result. Molecular pathology is developing rapidly, and further detailed evidence-based recommendations are required for many of the topics covered here. Molecular testing is therefore becoming an essential part of the work-up for many if not most patients with solid and haematological tumours. As a consequence, most hospitals with an active oncology practice require access to laboratories that provide the necessary information on the genetic make-up of a tumour from biopsy material. This trend is likely to strengthen as new drugs become available and those on the market start to be used in combination or sequentially to overcome resistance mechanisms. The challenge to the pathologist is to go beyond diagnosis and classification to produce the information required to guide treatment accurately and to do so in as short a time as possible. The simplest way to think about the requirements for laboratories offering these services is to consider the pathway from patient to result, and the requirements at each stage (figure 1). Inevitably, there will be differences between healthcare systems and laboratories in how they organise their work. The purpose of this framework is to assist molecular pathological laboratories in providing the best service to patients. Clear responsibilities for requesting molecular analysis, preanalytical sample handling, nucleic acid extraction and analysis, and reporting of results are prerequisites for the operation of a safe and efficient service. 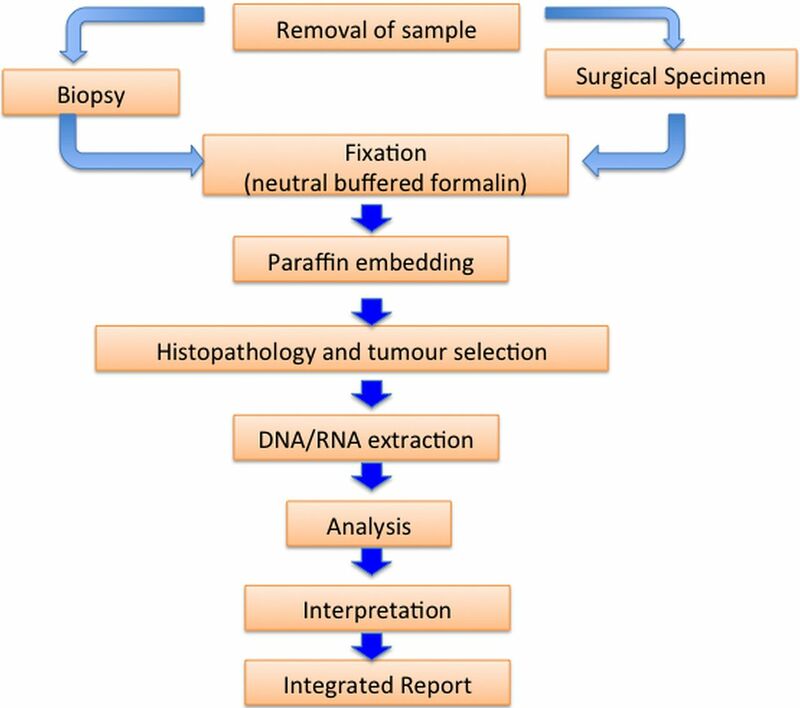 Workflow for laboratories undertaking molecular pathology for cancer patients from formalin-fixed paraffin-embedded (FFPE) tissue samples. One frequently asked question revolves around the number of samples any laboratory should be handling to be considered reliable. There are, at present, no data to answer this question, but we know from other settings (eg, ERBB2 (HER2) testing3 ,4) that it is not wise to consider setting up services for small numbers of patients, and indeed it is difficult to achieve a cost-effective solution for small numbers of samples. Equally, some genes are rarely mutated, and as laboratories adopt panel testing as the norm, even the largest laboratories are likely to find that they are reporting some mutations very rarely. Our belief is that the key to this question lies in the number of samples submitted for testing, and the clinical and logistic requirements of the service. The practicalities of testing and clinical needs may, therefore, make the decision straightforward for most tests. Given that the number of patients requiring testing is likely to increase, most accredited laboratories are likely to offer a reliable service if they adhere to the recommendations covered in the subsequent sections, though monitoring of this by national bodies is recommended. It should be noted that there is separate guidance available for the various steps in this pathway, and for individual testing needs. An excellent example, based on a systematic review, is the guidance recently issued by the College of American Pathologists (CAP), the International Association for the Study of Lung Cancer, and the Association for Molecular Pathology (AMP), for ALK and EGFR testing in lung cancer.5 This paper is intended to provide an overview to guide laboratories in operating a reliable service: we have incorporated many of their recommendations and those from other relevant publications2 ,6––10 and the ISO15189 guidance. Multiple medical disciplines (eg, surgery, oncology or pathology) may request molecular analysis to define a treatment strategy for individual patients, though in practice this will usually be the oncologist. In many cases, a multidisciplinary team (tumour board) will make the decision to request a test. The requesting process should ensure that the request is made appropriately, and that every patient who needs a test is offered one in a timely manner. This is one of the most difficult aspects of operating a molecular pathology laboratory: it is important to ensure that tests are requested on all patients who need one, but equally that unnecessary tests are not performed. Molecular testing is expensive, although costs are currently decreasing, and oncologists or multidisciplinary teams may feel that they need to manage demand, particularly if they manage the budget. However, automatic (reflex) testing by pathologists based on diagnosis and tissue availability within the pathology department can be more efficient, particularly if >10% of patients with a particular diagnosis require testing (Cree, unpublished). The decision to implement reflex testing should be based on a business plan, taking into account the costs in time and money of specimen retrieval from pathology archives when the result becomes clinically necessary.6 Additionally, the amount of tissue that can be obtained versus that required for molecular pathology should be included in considerations of the sampling strategy: this is a particular problem in lung cancer patients. There is also a need for flexibility: technology and requirements are changing rapidly and frequent reassessment of clinical need is essential. Good communication is required between the laboratory, the oncologists, and surgeons to ensure that necessary tests are requested timely. Previous treatment (eg, chemotherapy) can change gene expression11 and mutation status,12––14 and should be documented on the request form. It is important to discuss any changes to current protocols with surgeons and pathologists, who require clear identification of resection margins, but also need to accept the requirement for molecular analysis. Equally, interpretation of molecular analysis requires knowledge of the diagnosis and available treatment strategies. The pathology laboratory has to be able to handle multiple sample types. This raises a number of challenges when the needs of molecular analysis are included within a diagnostic pathway, though many of the issues are common to any diagnostic test. At every stage, there is potential for samples to be misidentified, and careful attention should be given to this danger. It is the responsibility of the person taking the specimen to identify the patient, the sample required, ensure that the sample is correctly labelled, fixed in formalin (where necessary), and/or dispatched to the laboratory. However, when samples are being acquired in particular situations, such as within an operating theatre, the primary responsibility of the operating theatre staff is to the patient, not the sample, and thought should be given to the need to implement and operate fail-safe procedures to ensure that samples are treated correctly in order to ensure that reliable and accurate diagnosis and test results can be obtained. The preanalytical process has recently been examined in some detail by the SPIDIA project (http://www.spidia.eu), the results of which we understand are due to be incorporated into ISO guidance (ISO 15189). Standard operating procedures (SOP) should be designed for tissue handling which incorporate aspects listed in the box 1. Patient and sample identification using four identifiers (eg, given name, surname, date of birth, hospital identification code). Container type—diagrams and checklists in theatres can help ensure correct use. Fixation requirements, including opening bowel specimens and incising large masses, while respecting resection margins. Liquid biopsy: EDTA blood samples can be used to extract nucleic acids from cells (buffy coat) and plasma. The leukocyte fraction provides a ready source of germline DNA and has long been used to generate molecular data for haematologic neoplasia. Viruses and bacteria can be isolated and identified by molecular methods from buffy coat preparations. Cell-free DNA can be used for mutation analysis and, although such methods have yet to enter routine practice, they show considerable promise.13 ,24 ,25 The preference is for plasma from EDTA blood, sent directly to the molecular pathology laboratory or to the blood sciences laboratory. Serum contains DNA from leukocytes and is less suitable. It is feasible to use samples taken for routine haematology measurements, but lithium heparin tubes should be avoided, as lithium is a PCR inhibitor. Caution should be exercised with RNA as measurement of levels can be affected by continuing production in cells after the specimen has been taken, and ongoing degradation by RNAse activity. Preventative measures should be taken to minimise such degradation of RNA, but rapid transport of samples on ice to laboratories is not a standard procedure in most hospitals, and establishing a cold chain or adding inhibitors to the samples as they are taken may be difficult. Specialised blood collection tubes are available to preserve RNA (eg, PAXgene, PreAnalytix/Qiagen; Valencia, California, USA), but their clinical use requires validation with the tests concerned. In clinical laboratories, all processes must have SOPs. It is important that these are used and adhered to using work instructions and checklists where necessary. There should be a dedicated process for the receipt of samples, which should be suitably staffed and allow accession numbers to be allocated to samples as they enter the laboratory (as per ISO 15189, and ISO 9001). Most Laboratory Management Information Systems (LIMS) allow this, but few have as yet acknowledged the need for integration of molecular pathology needs. Barcoding of samples is good practice and is encouraged. All samples should be tracked from patient to report. Tissue, blood and fluid processing within the laboratory should be performed to defined SOPs (see ISO 15189). While most tissue biopsy samples are received fixed, fresh tissue can also be sent to the laboratory for intraoperative frozen sectioning or molecular analysis. This requires separate SOPs and dedicated portering, nursing and laboratory staff. Tissue samples go through a macroscopic examination and cut-up stage, when blocks are taken and placed in bar-coded and/or numbered plastic cassettes for processing. Spare tissue in formalin can be retained at this stage. Vacuum or microwave-based processors are temperature controlled devices which ensure excellent penetration of graded alcohols and xylene substitutes, allowing paraffin embedding. The temperature for different machines and protocols can vary substantially, and this can affect nucleic acid recovery (Cree, unpublished). The use of fixed tissue that has been previously frozen is not advised, and decalcification reduces DNA and particularly RNA recovery. Both have been found to produce no or suboptimal results.26 ,27 ,28 Close collaboration between clinical teams and histopathology laboratories is advised, and it is critical that changes in processing are communicated to the molecular pathology laboratory and adapted where necessary. It is recommended that the pathologist marks the area of the section containing neoplasia on the H&E slide at the time of diagnosis for macrodissection or microdissection, if used. It may be necessary to mark multiple areas of the neoplasia for manual microdissection to account for heterogeneity of neoplastic cell content within large tumours. As an alternative to microdissection, 1 mm punches of marked areas may be used.30 Laser capture microdissection is largely a research tool and not necessary for routine molecular pathology. The histopathologist should estimate the percentage of neoplastic cells present in the sample (or part of the sample) selected for DNA/RNA extraction. This estimation can be important in determining success or failure of subsequent testing, as it may define the lower limit of detection and a minimum percentage of neoplastic cells present can be applied to many tests.31 If necrosis is present, this should be noted, but is best avoided in samples for molecular analysis. Widely dispersed tumour cells within a sample, or lymphangitis carcinomatosa, are both notorious examples in which a low percentage of neoplastic cells can produce false negative results. Where the pathologist is directly responsible for requesting the molecular analysis, such ‘reflex’ testing permits rapid turnaround times and prevents the need for retrieval of blocks at a later date, reducing test turnaround time, reducing staff time and therefore cost. This needs to be balanced against unnecessary testing in patients who do not need further treatment, or who need treatment at a later date when testing for mutations in alternative genes might be needed. Clear responsibilities for the assessment of neoplastic cell content and macrodissection or microdissection are required: this is an essential role of the histopathologist. The estimated percentage of neoplastic cells present in the tissue used for DNA/RNA extraction should be mentioned in the pathology report. Blood samples (EDTA) are usually spun down at low speed to pellet red cells and retrieve the buffy coat, and plasma fractions. Processing should begin as soon as possible (ideally within 30 min) after sampling. Collection time should be indicated on the tube, and the elapsed period between sampling and processing should be recorded. Cells are usually removed from plasma by centrifugation at 1000–2000 g for 10 min using a refrigerated centrifuge. Centrifugation at 2000 g for 15 min also depletes platelets in the plasma sample. Again, a protocol should be strictly observed. It is feasible to use density centrifugation to obtain white cells, exosomes, and plasma from the same sample.32 Specimens can be flagged on many LIMS for molecular analysis and reflex testing may be feasible. Aliquoted plasma samples can be stored at −80°C. SOPs should be established for secure and, where possible, controlled collection, handling, and storage of tissue and blood samples, and their fractions (including extracted nucleic acids) (see ISO 15189 and any national guidelines). Few laboratories maintain their stores of tissue blocks and slides in temperature controlled environments. Equally, blood samples are usually discarded within days of receipt. Blood and blood-derived products are considered biohazards and should be handled accordingly. Fresh tissue poses similar risk, but FFPE tissue is regarded as safe for handling, though chemicals involved in tissue processing need careful storage and handling. The extraction of nucleic acids for clinical use requires quality controlled reagents, ideally IVD CE-marked. A large number of companies produce kits, though few are sold for clinical use, and it is the responsibility of the laboratory to validate and verify any methods performed against existing standards. Some multicentre validation data have been published,33 but such direct comparisons are rare. Consideration of which method to use should consider throughput, required quality and quantity of DNA or RNA and intended methods of analysis. Manual methods are commonly used. The majority of the manual methods use precipitation-wash steps with centrifugation of spin columns or filters. Even kits require training and considerable skill, but can provide excellent results. Special care should be taken to avoid sample misidentification and contamination. Careful adherence to SOPs is important—the use of checklists and careful staff training can help. Automated methods are useful as they can economise on staff time and can help to prevent sample misidentification. They tend to use magnetic bead extraction methods, which are suited to robotic systems. It is important to trial such systems before implementation, as not all are adept at blood and FFPE block extraction: several machines may be required to handle all sample types and varying throughput. Quantification of DNA and RNA can be performed by spectrophotometry, fluorometry or PCR. Different methods advocate different machines: the Nanodrop spectrophotometer, Qubit fluorometer, or Agilent Bioanalyser are all widely used. The DNA degradation in FFPE samples reduce the precision of spectrophotometer measurement. However, quantitative real-time PCR can be used to establish amounts, sizes and amplificability of DNA and RNA with considerable accuracy and limited sample consumption. SOPs should indicate which validated methods are preferred for each test performed in the laboratory, and staff should be trained appropriately. Continuous audit of preanalytical performance with internal quality control is important, so that changes in specimen handling and nucleic acid extraction can be implemented safely. store sequencing libraries in a separate freezer at −20°C or −80°C. There are insufficient data on the effects of length of storage on tissue and extracted DNA or RNA for different analytical methods: this is a consideration likely to be of increasing importance as patients may need tests done many years after samples have been taken. DNA, or cDNA, is more stable than RNA and is likely to survive many years under the conditions given. Testing requirements are defined by clinical need, and this, in turn, is defined by the availability of drugs for which actionable mutations have been identified (table 1). This list is expanding rapidly, and individual laboratories need to coordinate their testing with the needs of oncologists on a regular basis.34 In some cancers, mutations are mainly located in a few exons (‘hotspots’) and rarely found elsewhere within the gene. As the goal is to identify actionable mutations, laboratories should screen for all mutations with clinical evidence of efficacy. For instance, in the EGFR gene, mutations in exon 18 should be systematically screened even if they represent less than 5% of the identified alterations. National guidelines may also indicate minimum requirements (eg, Germany requires testing on biomarkers of 1% or more incidence). In many laboratories, there is a move away from single-gene assays towards panel testing, and to reflect this change in practice. External quality assessment (EQA) schemes are, or have moved to, tumour-specific schemes, distributing tumour samples for testing of multiple genes depending on individual laboratory practice (http://www.ukneqas-molgen.org.uk/; http://www.esp-pathology.org). Such schemes expect the currently relevant actionable mutations to be tested, but will also assess the genotyping accuracy for other gene tests where this is appropriate. Other considerations in making the choice of analytical method are the number of samples that require testing, the number of genes being tested, and the percentage of mutations tested for in each gene. Most pathology laboratories now have real-time PCR machines that are perfectly capable of running well-established kits that cover 95% of the actionable mutations in a particular gene. Sanger and pyrosequencing methods are also widely available. In high throughput units, it may be economical to use next-generation sequencing (NGS) platforms, which have the advantage of a more extensive coverage of an increasing number of genes of interest. The amount of tissue available is often the limiting factor as to the extent of the testing performed (eg, fine needle aspirate, endoscopic or needle biopsy) and may influence which technology is chosen. The degree of staff expertise, equipment and infrastructure required should also be considered. Many workflows in molecular pathology require separation of stages in different compartments (ideally rooms) to prevent DNA and RNA contamination. Separation of pre-PCR and post-PCR steps is particularly important. ISO15189 requires thorough validation of in-house tests compared to CE-marked in vitro diagnostic (CE-IVD) tests. However, because most tests are only part of the whole process, the complete procedure including preanalytic, analytic and postanalytic phases should be validated in-depth. These considerations typically determine the choice of technology. In practice, the options are based on real-time PCR or sequencing solutions. Companies providing such options have been assessed independently for EGFR (http://www.nice.org.uk/dg9) and KRAS mutation testing (http://guidance.nice.org.uk/DT/14), but limited data is available on many methodologies. The pace of change in technology is considerable and no recommendations are made here, other than to state that instruments and kits should usually be IVD CE-marked, and assays validated against existing performance specifications. Validation and verification of tests is important, both within consortia of companies, academic and hospital laboratories, and by individual laboratories offering tests for clinical use. Batch-to-batch variation is a particular problem for complex reagents, and several mutation detection kits have shown problematic fluctuations in performance in recent years. ISO15189 requires checks on new batches of reagents on the premise that nothing should be assumed to work without rigorous checking. It is essential to monitor the performance of all tests within pathology laboratories to ensure that all measurable parameters remain within acceptable limits, as defined in the validation report for the test. In most cases, these are defined statistically based on known variation. Using simple statistics it is possible to establish CIs within which the assay is behaving correctly (eg, Shewart rules36 ,37). For example, manufacturers of kits often (though not always) provide internal controls or reference genes, the levels of which should not vary for the same DNA input. While variation between samples is common, this should not exceed certain parameters, definable from the standard operating procedure. In-house tests should use externally sourced controls wherever possible. The percentage of mutations detected for individual tumour types can vary depending on the population tested, but results outside national confidence limits should always be questioned. Again, experience from HER2 testing is apposite and it should be noted that knowledge of this came from a long-term database project to collect data from many laboratories taking part in EQA schemes.3 The percentage of patients with a particular mutation may reflect ethnic mix, environmental factors, and age distribution. These may be very different to the demographics within clinical trials of particular drugs and result in considerable differences in treatment within populations. Turnaround time is often used by healthcare managers to judge services, and can be a blunt tool. The timeliness of reports is critical to patient care and depends on patient pathways in practice in individual centres. For example, the requirement for EGFR testing in lung cancer is usually <5 working days, with a maximum of 10 working days,5 but for reflex testing of high-risk melanoma or colorectal cancer, when the results go into the patient's notes for later use if they require treatment, then obtaining the results within a month may be sufficient. Acceptability of longer turnaround time may permit greater control of testing (demand management) or batching of samples to improve the cost effectiveness of testing. For all laboratories, regular participation in external quality assessment is needed to verify and improve the quality of testing, as described below. Continuity planning is a further issue: the solution to problems with equipment due to breakdowns or limited staff availability should not be allowed to interrupt a service. Sending samples away to another laboratory may be necessary, but ensuring that alternative equipment or staff is available can prevent cessation of service and avoid patients having to wait for treatment decisions. The referring laboratory should check the service standards of laboratories used for referral. Molecular pathology external quality assessment schemes across Europe score the report as well as the test result, and help to guide and educate laboratories as to what should be included in a report.2 ,39 The European Society of Pathology has produced guidance for these schemes that has defined how reports will be marked, and this will drive the response of laboratories.2 Equally, laboratories across Europe are usually required to have accreditation. For instance, in the UK, this is by the UK Accreditation Service (UKAS), ISO 15189 or equivalent, and the inspectors look closely at reports and reporting standards. In Germany, the labs that pass the nationwide round robin tests performed by QuiP (Quality in Pathology, a joint quality assurance programme of the German Society of Pathology and the German Association of Pathologists) are published, which gives clinicians and patients the possibility to check their reliability. Italy has a similar policy operated by the Italian Association of Medical Oncology (AIOM) and the Italian Society of Pathology (SIAPEC) that organise their external quality assessment schemes.45 ,46 Finally, there are internal considerations in many hospitals and laboratories, often due to clinician or pathologist preferences. A suggested format is shown at (http://kras.eqascheme.org/info/public/education/example_reports.xhtml). The folowing are the three key areas that should be present within reports. The patient must be identified correctly – laboratories require a minimum of two unique patient identifiers plus a unique sample identifier to be present on the request form and report. These include the patient name (family name), date of birth, hospital and national identification number. The ward or service, date of biopsy, and referring clinician name should also be stated. Long reports are rarely read in full, and length matters; one page, or better still, single-screen reports are preferred provided that they are legible. If reports are more than one page in length then each page should have appropriate patient identifiers in order to be linked to the correct patient, and the pages should be numbered, that is, page 1 of 3, so the reader of the report is aware if any pages are missing (see also ISO 15189 for guidance). Clear presentation of the results, the test(s) performed, and any limitations of the tests (eg, were all possible mutations tested, or just a selection of the common ones?). For some tests, the percentage of the sample occupied by the target of the test (eg, neoplastic cells) is important. Ideally, the report should contain basic information about fixation (fixative, time of fixation, etc.) for quality control, though this may be held within the departmental records rather than reported. The name of the individual taking responsibility for the test and contact details are important, and some form of authorisation with date. Due to legal regulations in some European countries, the pathologist who is finally responsible for the combined ‘morphological-molecular report’ must be clearly identifiable. Spell checkers are useful for preventing spelling and typographical errors. The result of the test must be correctly reported and interpretation provided, particularly where this involves a treatment decision. Genotyping results should be given according to HGVS nomenclature (http://www.hgvs.org/mutnomen/) at the DNA level and the protein level, with appropriate reference sequences provided. External quality assurance schemes require laboratories to provide accurate interpretation of the result(s) obtained and include any relevant advice. Care should be taken to ensure this advice is as up to date as possible, and if conflicting data is published then this should be included in the report. In view of the growth of companion diagnostic tests in molecular pathology, pathologists may increasingly be required to include the clinical interpretation with advice on treatment options. The type and extent of molecular analysis used should be clearly described to allow oncologists to request further testing if the clinical situation warrants this. There is a widely acknowledged need for integrated reporting of results, and as the introduction of gene panel testing becomes more widespread then the results of the different gene tests should be reported on one report. Also, results from several pathology specialties on individual patients need to be integrated into the same report. For instance, a patient with an enlarged lymph node may have a biopsy and blood sample providing reports from histopathology, microbiology, immunology, molecular pathology, haematology and biochemistry. The clinician treating the patient has to integrate these with radiological and clinical investigations to make optimal decisions. While it is helpful to have all the pathology results within a single report, not all countries have integrated pathology services. Different reporting times and systems can also make this very difficult to achieve. The best solution seems to be a combined reporting system, or electronic patient record, that permits the clinician or multidisciplinary team to determine whether they have all the information available to enable reasoned conclusions. We believe that all laboratories providing molecular pathology services should have laboratory accreditation according to ISO 15189 or their national equivalent. Accreditation provides patients, staff, service users and commissioners with evidence of laboratory competence. The standards include the provision of adequate facilities, trained staff and documentation. We recommend that as part of this accreditation, laboratories should ensure that their companion diagnostic tests cover all relevant genes that appear in the Summary of Product Characteristics (SmPC) published for the drug. Laboratories that want to proceed towards accreditation should contact their national accreditation body (NAB).47 Most NABs have formal application documents to be filled out, and require preliminary documentation on the laboratory itself and the existing quality management system (QMS). The accreditation body will then appoint a lead assessor and a technical assessor(s) who are experts in the field. This team of assessors will conduct the audit (external audit) in the laboratory and they will formally report the assessment findings to the NAB. In case of minor non-compliances, the assessor will later check whether the corrective actions were adequate, through submitted documentation. In case of major non-compliances, a new on-site assessment may be required to assess the effectiveness of the corrective actions. Accreditation may be granted for a period of up to 3 or 5 years, but the NABs will perform surveillance visits to ensure that the laboratory continues to meet requirements, which is typically every 1–2 years. The procedure for renewal of accreditation is usually very similar to the one for new applicants, but the laboratory might consider at that moment to widen the scope of the accreditation by adding new tests. There has been less written about the need for internal quality assessment. The use of control materials within each run is recommended where the technique allows this. The results of internal control testing should be monitored to assure end-to-end performance of the test.50 Internal controls should be run with all batches. Internal positive controls can be prepared from samples with sufficient surplus material to permit this, or bought from commercial sources. Standardised products should be used to assure the stability and the external validation of the results. In some countries, national reference centres may provide control material, and although amounts are often limited, they can be helpful as a check on internally generated control material. The errors picked up by EQA fall into several categories. Misidentification at all stages of the testing process is an issue, resulting in incorrect assignment of mutation or wild-type results and, ultimately, incorrect treatment of the patient. Genotyping errors do occur, often from human error, not following SOPs, and performing methods suboptimally. Careful internal validation of tests is essential, and recording lot and batch numbers can save weeks of investigation with manufacturers. Interpretative errors are less common, and likely to be picked up by clinical teams if the data presented does not match the conclusion. It is therefore essential that the results of the test and the interpretation are stated in the report. It is essential that those participating in EQA schemes read the reports that detail errors made by all participants and act on recommendations made, as well as ensuring that their own errors are corrected rapidly. Poor performing laboratories should cease their service immediately, perform a root cause analysis and review cases that may have been affected by systemic errors. They should send samples to another provider until certain that their testing is safe. While in some countries EQA providers can and do report poor performing laboratories to regulators, this is not the case across Europe.49 ,49 In either case, it is incumbent on the heads of laboratories to act on EQA results and ensure patient safety. Staff availability and training should be in line with accreditation requirements for each country. The level of training required to operate some machines is minimal, though it can be extensive, but the interpretation of results is often complex. Complexity of testing procedures and interpretation are increasing with the growing demand of testing of a panel of genes on limited material and the accompanying introduction of NGS techniques. Staff with appropriate competencies must be available at every stage of the preanalytical pathway, to extract nucleic acids, to perform the analysis, to interpret and report the results, and to take clinical responsibility for their transmission to the oncologist. For instance, in most of Europe, the ultimate responsibility for a diagnosis on tissue and cytological material and the report to the patient's physician rests with the pathologist (of any discipline) who authorises the report. It is important that he or she has sufficient knowledge of the analytical requirements for molecular pathology. Equally, clinical or molecular scientists performing such tests need to know how their analytical requirements match the available samples. Both need to understand the consequences of their work for the patient, including treatment decisions. It is good practice to establish molecular pathology with a multidisciplinary team with technical, scientific and medical staff that provides feedback and training for staff as well as excellence for patients. The Dutch Society of Pathology has recently started a 2-year training programme to educate molecular biologists in molecular pathology (http://www.pathology.nl), and the Royal College of Pathologists has a fellowship curriculum in molecular pathology for clinical scientists under development. In the USA, a molecular pathology curriculum for medical laboratory scientists has recently been published by the AMP.51 With the complexity of data obtained by next-generation-sequencing, bioinformatics experts are likely to join the molecular pathology team in the near future. It is essential to ensure that staff receive regular opportunities for continuous professional development. In a fast-moving field such as molecular pathology, the need for staff at every level to be up to date with new developments and trained at each stage of the process is considerable and should be factored into the costs of running a safe and effective service. Molecular pathology is developing rapidly as the technology improves, new anticancer drugs come to the clinic, and interpretation of results becomes apparent. Laboratories involved in this work are encouraged to take part in research, and for many it is an integral part of their practice. For these new targeted therapies, laboratories should be aware that the biomarker which has been clinically validated in conjunction with the therapy to define the patient population most likely to benefit will, in almost all cases, have been tested using an IVD (CE Mark) with specific performance characteristics including a defined cut-off value. It is recommended that if an IVD is to be substituted, then the laboratory direct comparison of the new test with the IVD is undertaken to ensure accurate patient selection using the alternative test. Contributing test data to databases (ensuring it is clear as to what methodology has been employed) is an obvious example, but evaluation of new technologies against existing tests, or exploring the health economics of test strategies are all important. Close cooperation between molecular pathologists, clinicians designing clinical studies involving companion diagnostics, and research-orientated pharmaceutical industry is necessary. There is established guidance for the reporting of diagnostic validation—STAndards for the Reporting of Diagnostic accuracy studies (STARD, http://www.stard-statement.org), as part of the EQUATOR network of research report standards (http://www.equator-network.org/toolkits). Molecular pathology is developing rapidly and there is a danger that guidance becomes outdated by the time it is published. As Nils Bohr said, ‘Prediction is hard, especially about the future’. However, given the need for guidance, the European Society of Pathology and RCPath groups have decided to promulgate this general guidance as best practice, and will produce more detailed guidance on individual aspects of this paper as necessary. Molecular testing is becoming an important part of the diagnosis of any patient with cancer. To meet this need, laboratories need to use reliable methods and processes to ensure that patients receive a timely and accurate report on which their treatment will be based. This paper provides guidance on the minimum requirements for the management of molecular pathology laboratories and should be augmented by the specific guidance available for different tumour types and tests. Preanalytical considerations are important, and careful consideration of the way in which specimens are obtained and reach the laboratory, is necessary. The choice of nucleic acid extraction and analytical method depends on clinical need, desired turnaround time, equipment and expertise available. Laboratory accreditation, internal quality control, and continual participation in external quality assessment schemes are prerequisites for delivery of a reliable service. Molecular pathology reports should be integrated with the histopathology report, and should be discussed in multidisciplinary team meetings. We are grateful to the Associazione Italiana di Oncologia Medica (AIOM) for supporting the meetings in Naples, and to the Royal College of Pathologists for supporting meetings in London. Large numbers of individuals have commented on these consensus guidelines and we have listed their contributions below. However, we may well be unaware of some contributions from members of both the ESP and RCPath. Their input is very much valued and gratefully acknowledged.
. The genetic basis for cancer treatment decisions. Cell 2012;148:409–20.
. Guideline on the requirements of external quality assessment programs in molecular pathology. Virchows Arch 2013;462:27–37.
. HER2 testing by local, central, and reference laboratories in specimens from the North Central Cancer Treatment Group N9831 intergroup adjuvant trial. J Clin Oncol 2006;24:3032–8.
. Molecular testing guideline for selection of lung cancer patients for EGFR and ALK tyrosine kinase inhibitors: guideline from the College of American Pathologists, International Association for the Study of Lung Cancer, and Association for Molecular Pathology. Arch Pathol Lab Med 2013;137:828–60.
. Developing national guidance on genetic testing for breast cancer predisposition: the role of economic evidence? Genet Test Mol Biomarkers 2012;16:580–91.
. Guidance on the development and validation of diagnostic tests that depend on nucleic acid amplification and detection. J Clin Virology 2013;56:260–70.
. Best Practice No 176: Updated recommendations for HER2 testing in the UK. J Clin Pathol 2004;57:233–7.
. European consensus conference for external quality assessment in molecular pathology. Ann Oncol 2013;24:1958–63.
. Preparing pathology for personalized medicine: possibilities for improvement of the pre-analytical phase. Histopathology 2011;59:1–7.
. Cancer cell adaptation to chemotherapy. BMC Cancer 2005;5:78.
. Emergence of KRAS mutations and acquired resistance to anti-EGFR therapy in colorectal cancer. Nature 2012;486:532–6.
. Recommendations for improved standardization of immunohistochemistry. Appl Immunohistochem Mol Morphol 2007;15:124–33.
. The challenge and importance of standardizing pre-analytical variables in surgical pathology specimens for clinical care and translational research. Biotech Histochem 2012;87:14–17.
. Quantitative assessment shows loss of antigenic epitopes as a function of pre-analytic variables. Lab Invest 2011;91:1253–61.
. Tissue transfer to pathology labs: under vacuum is the safe alternative to formalin. Virchows Arch 2008;452:229–31.
. Formalin fixation at low temperature better preserves nucleic acid integrity. PloS ONE 2011;6:e21043.
. A brief retrospective report on the feasibility of epidermal growth factor receptor and KRAS mutation analysis in transesophageal ultrasound- and endobronchial ultrasound-guided fine needle cytological aspirates. J Thorac Oncol 2010;5:1664–7.
. Reliability of direct sequencing of EGFR: comparison between cytological and histological samples from the same patient. Anticancer Res 2011;31:4207–10.
. High concordance of EGFR mutation status between histologic and corresponding cytologic specimens of lung adenocarcinomas. Cancer Cytopathol 2013;121:311–19.
. Detection of EGFR mutations and EML4-ALK rearrangements in lung adenocarcinomas using archived cytological slides. Cancer Cytopathol 2013;121:370–6.
. Noninvasive identification and monitoring of cancer mutations by targeted deep sequencing of plasma DNA. Sci Transl Med 2012;4:136ra68.
. Amplification of PCR products in excess of 600 base pairs using DNA extracted from decalcified, paraffin wax embedded bone marrow trephine biopsies. Mol Pathol 2000;53:19–23.
. Opening the archives for state of the art tumour genetic research: sample processing for array-CGH using decalcified, formalin-fixed, paraffin-embedded tissue-derived DNA samples. BMC Res Notes 2011;4:1.
. Analysis of the effect of various decalcification agents on the quantity and quality of nucleic acid (DNA and RNA) recovered from bone biopsies. Ann Diagn Pathol 2013;17:322–6.
. Improved PCR performance using template DNA from formalin-fixed and paraffin-embedded tissues by overcoming PCR inhibition. PloS ONE 2013;8:e77771.
. Molecular basis of chemosensitivity of platinum pre-treated ovarian cancer to chemotherapy. Br J Cancer 2010;103:656–62.
. KRAS mutation analysis on low percentage of colon cancer cells: the importance of quality assurance. Virchows Arch 2013;462:39–46.
. Circulating tumour markers can define patients with normal colons, benign polyps, and cancers. Br J Cancer 2011;105:239–45.
. Multicentre validation study of nucleic acids extraction from FFPE tissues. Virchows Arch 2010;457:309–17.
. Molecular diagnostics and personalized medicine in oncology: challenges and opportunities. J Cell Biochem 2013;114:514–24.
. Genotyping and genomic profiling of non-small-cell lung cancer: implications for current and future therapies. J Clin Oncol 2013;31:1039–49.
. Combined Shewhart-cusum control chart for improved quality control in clinical chemistry. Clin Chem 1977;23:1881–7.
. Patterns of cancer genetic testing: a randomized survey of Oregon clinicians. J Cancer Epidemiol 2012;2012:294730.
. Higher quality of molecular testing, an unfulfilled priority: results from external quality assessment for KRAS mutation testing in colorectal cancer. J Mol Diagn 2014;16:371–7.
. Improved reliability of lymphoma diagnostics via PCR-based clonality testing: report of the BIOMED-2 Concerted Action BHM4-CT98-3936. Leukemia 2007;21:201–6.
. Web-based synoptic reporting for cancer checklists. J Pathol Inform 2011;2:16.
. Clinical laboratory reports in molecular pathology. Arch Pathol Lab Med 2007;131:852–63.
. Closing the quality loop: facilitating improvement in oncology practice through timely access to clinical performance indicators. J Oncol Pract 2013;9:e255–61.
. The challenge of NSCLC diagnosis and predictive analysis on small samples. Practical approach of a working group. Lung Cancer 2012;76:1–18.
. Results of the First Italian External Quality Assurance Scheme for somatic EGFR mutation testing in non-small-cell lung cancer. J Thorac Oncol 2013;8:773–8.
. KRAS mutations testing in colorectal carcinoma patients in Italy: from guidelines to external quality assessment. PloS ONE 2011;6:e29146.
. Approaches to quality management and accreditation in a genetic testing laboratory. Eur J Hum Genet 2010;18(Suppl 1):S1–19.
. External quality assessment for KRAS testing is needed: setup of a European program and report of the first joined regional quality assessment rounds. Oncologist 2011;16:467–78.
. Next generation diagnostic molecular pathology: Critical appraisal of quality assurance in Europe. Mol Oncol 2014;8:830–9.
. Implementation of formalin-fixed, paraffin-embedded cell line pellets as high-quality process controls in quality assessment programs for KRAS mutation analysis. J Mol Diagn 2012;14:187–91.
. Molecular pathology curriculum for medical laboratory scientists: a report of the association for molecular pathology training and education committee. J Mol Diagn 2014;16:288–96. Collaborators The full group is composed of: Martin Barnardo; Fiona Blackhall; Elke Boone; Gerardo Botti; Rachel Butler; Fatima Carneiro; Ilhan Celik; Fortunato Ciardiello; Peter Collins; Finbarr Cotter; Ian Cree; Zandra Deans; Els Dequeker; Manfred Dietel; Klaus Duecker; Anders Edsjo; Stephen Finn; Patricia Groenen; Marta Hall; Elizabeth Hodges; Ansar Jawaid; Andreas Jung; Noor Kalsheker; Outi Kamarainen; Keith Kerr; Hans Kreipe; Marjolijn Ligtenberg; Jo Martin; Antonio Marchetti; Ivonne Marondel; Rose McCormack; Keith Miller; Sam Murray; Adrian Newland; Nicola Normanno; Frederiqu Nowak; Frank Opdam; Scott Patterson; Simon Patton; John Paul; Carmine Pinto; Peter Pokinskyj; Archie Prentice; Etienne Rouleau; Manuel Salto-Tellez; Marco Santucci; Anna Sapino; Ed Schuuring; Emily Shaw; Bert Siebers; Francesc Sole; Rolf Stahel; Giorgio Stanta; Edit Szepessy; Miquel Taron; Sabine Tejpar; Erik Thunnissen; Wim Timens; Han van Krieken; George Vassiliou; Mike Wells; Newton Wong. Contributors The contributors listed were involved in the inception, discussion and finalisation of this guidance. IAC, ZD, MJLL, NN, AE, ER, ET and JHVK conceived the concept for the guidance, which was written by IAC, by ZD, MJLL, NN, AE, ER, FS, ET, WT, ES, ED, SM, MD, PG and JHVK on behalf of the group, all of whom commented on drafts within meetings or by email. The paper was finalised and submitted by IAC. Competing interests This paper is the result of three meetings of the External Quality Assurance group of the European Society of Pathology in Naples, which were attended by employees from Abbott, Amgen, AIOM, AstraZeneca, GSK, Roche, Merck Serono, Pfizer, Thermo-Fisher, Qiagen, Silicon Biosystems. The authors have multiple relationships with diagnostic and pharmaceutical companies active in the development of companion diagnostics for cancer, including grant funding, service funding and consultancy.